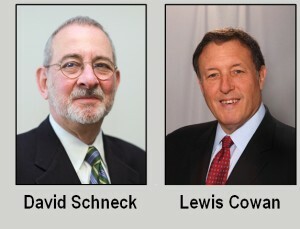 Mohr Partners, Inc., an international corporatereal estate services, advisory andconsulting firm, has relocated its New York, NY office to 232 Madison Avenue, New York, NY 10016 and has appointed David Schneck as Executive Managing Director, joining Lewis Cowan, Managing Partner. Mr. Schneck brings over four decades of commercial real estate experience specializing in commercial leasing in Manhattan. Over the course of his distinguished career, he has been personally responsible for leasing over 20 million SF of space with an overall value of $20 billion. Prior to joining Mohr Partners, Mr. Schneck served as an Executive Vice President at CSCommercial Team and a Senior Vice President at HelmsleySpear. Previously, Mr. Schneck was an Executive Managing Director at Grubb & Ellis. He was twice selected as the number one producer in the New York office and consistently earned selection to Grubb & Ellis’ Circle of Exellence, an achievement reserved for the firm’s top producing brokers nationally. As a tenant representative, Mr. Schneck has represented many prominent companies in the non-profit, publishing, corporate, diplomatic, healthcare, entertainment, higher-education, financial, law, accounting, securities and tech industries. He holds a Bachelor of Science in Business Administration from the University of Alabama. “I was very impressed with Mohr Partners as a company, being one of the largest U.S. based commercial real estate tenant representatives with a strong global presence. I look forward to adding my expertise to a firm that has been providing excellent client service for over 26 years,” said Mr. Schneck.